Symmetry Sleep Position System Discounts Apply ! Position your baby to help prevent Flat Head Syndrome! The Symmetry Sleep Postioner helps prevent Positional Plagiocephaly (flat head syndrome) by proper sleep rotation. 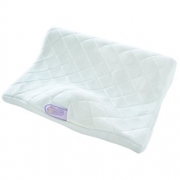 An easy-to-use positioner for parents, and a comforting place to sleep for baby makes this a great shower gift. Your purchase includes a caliper designed by Dr. Ricardo Hahn ("Dr. Plagio") to monitor the symmetry of baby's head. *This item will ship by UPS ground and may be shipped separately from other items in your order.